A nice espresso in the morning can be the perfect thing to make sure that you’re ready to get up and moving. If you’re the type of person that needs their espresso to make sure that they can face the day then these best super automatic espresso machine reviews are going to be great for you. That’s because we’re going to help you figure out how to get that morning cup without having to put in all the effort when you’re only half awake. Type: What type of machine are you actually getting? Is it actually a fully automatic machine? Is it a super automatic or a semi-automatic? You want to know what you’re getting before you buy for your personal preference. Dimensions: What size is the machine? Is it going to fit on your counter? You need to make sure you have the space for the unit before you go through all the trouble of buying something that isn’t going to work. Power: What type of power is it using? How many watts is the unit you’re looking at? You want to make sure you have the right wattage available and you definitely want to make sure you can afford to pay for that power. Finish: What is the finish of the unit? What does it look like on the outside? You want to make sure it’s going to look great in your kitchen so you should pay attention to this, even though it’s about personal preference. Water Capacity: How much water does it hold? This is going to let you know more about how many cups it’s going to make at a time and when you’re going to have to fill it up again. But this is a personal preference too. Warranty: How long is the warranty? Can you trust the unit to last for a long time or are you going to be looking again soon? A longer warranty means the company stands behind the product even more and generally means good things. There are plenty of espresso machines out there but when you’re looking to really bump up the quality of what you get you narrow things down a bit. Luckily for you, we’ve narrowed things down even more and found ten of the best options. Then we give you the automatic espresso machine reviews that you need to make sure you make the right decision when it comes to how you’re going to get that morning cup. 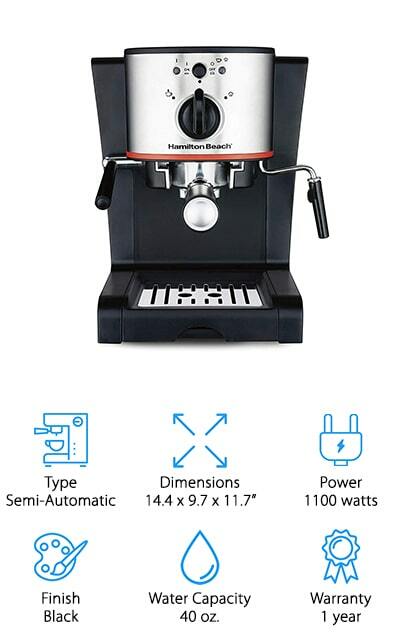 Our top pick for best super automatic espresso machine is by Breville, a company that’s definitely well-known for the high-quality coffee products they produce. This large unit is stainless steel for a sleek and elegant look and also provides you with a fully automatic system. It’s a 15 bar Italian pump with 1600 watt thermo coil heating but the overall model has 1750 watts of power. It also holds up to 64 ounces of water at a time so you’ll have no problem getting as many cups as you need at the same time. The conical burr grinder has a ½ pound sealed bean hopper to hold plenty of your favorite beans and this unit will give you just about anything you could want, including the milk foam to go on top of your favorite coffee drinks. Our best semi-automatic espresso machine is made by another brand popular for their coffee products, but for a little more basic varieties. 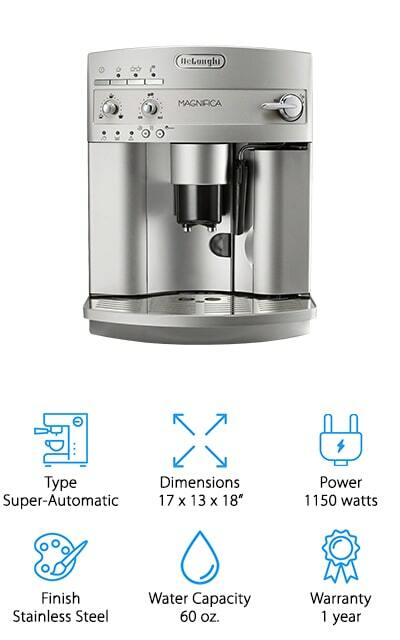 This one still gives you a 15 bar pump system that gets great quality espresso and it has an automatic milk frother to make sure you get the perfect topping to your drinks as well. The easy to fill and easy to remove water and milk reservoirs are large enough to make several cups at a time and the fact that this unit can make espresso, cappuccino, and lattes is definitely a bonus. The stainless steel look is sleek and perfect for any kitchen while the 1040 watts of power are plenty to keep your machine running and brewing as long as you want. The one-touch control panel makes it easy to select a drink and the different color options let you choose your personal style. This super automatic espresso machine is stainless steel so it fits in with just about any kitchen décor. It also has a 60-ounce water capacity so you can feel confident that it’s going to be full when you want to brew that next cup. 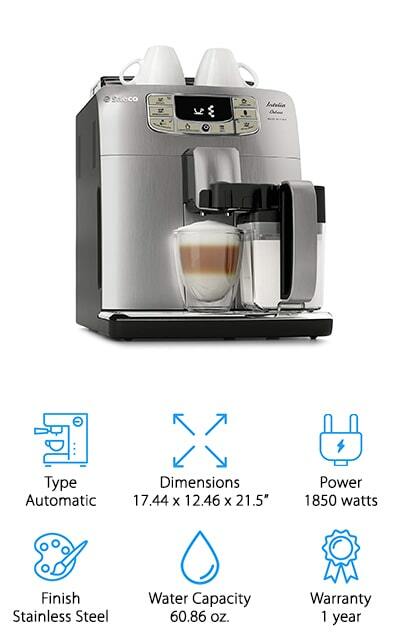 It has a patented Cappuccino System frother that creates the ideal froth for the top of your drinks and it has a rotary and push-button control panel that you can program to your own menu settings. It grinds the beans from the hopper instantly and it has a simple clean system that keeps the entire machine ready to go the next time. You won’t need to spend as much time on the cleaning cycle either, because it doesn’t require the monthly cleaning tablets that many other similar options do. You’ll have 1150 watts of power and a 1-year warranty that let you know this is going to keep working just like you need. 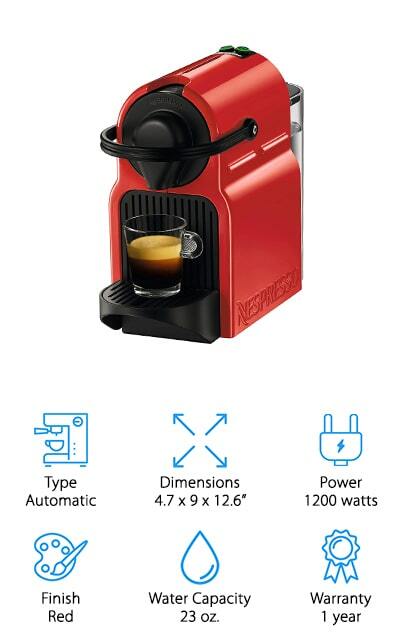 This red unit is definitely going to look unique in your house and it’s definitely going to create a great cup of espresso as well. It has an automatic operation and actually provides 19 bars of pressure with 1200 watts of power. It’s small in size, so you’re going to need less space on your counter and it still holds 23 ounces of water at a time. Even better, the water reaches the ideal temperature in less than 25 seconds so you can get that cup of coffee you really want right away. You can brew espresso and lungo sizes with just one button and you can even pour it over ice to create an iced drink. There’s a drip tray to make sure you don’t have a mess to clean up and you get a welcome kit with capsules to try out different flavor options. 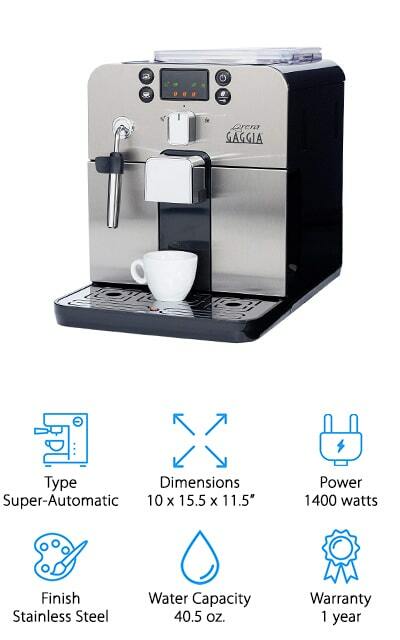 If you want the best fully automatic espresso machine that doesn’t look like the ones you’ll find at your local coffee house then this is the way to go. It’s a sleek unit that’s black in color and actually hides all of the mechanisms that you normally see. It has 3 cup size options to choose from which you get to set and has a water capacity of 36.8 ounces so there’s always plenty available. 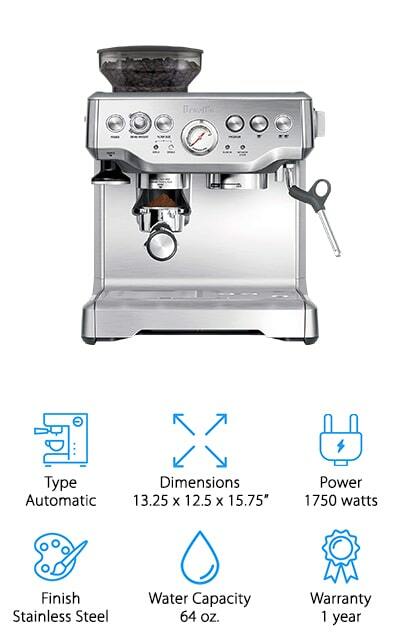 Not only that but it has multi-level grinding and microbrewing to create the ideal cup of espresso every time. Ultra-compact, it fits easily on your counter and delivers the right amount of power at 1450 watts. It also has an automatic energy saving mode and can be programmed when to turn off. When it is off it even uses absolutely no energy to keep your electric use down. This may just be the best commercial super automatic espresso machine, though you’re going to need a little bit more time to make that cup. You’ll get the highest quality results and you’ll get a 15 bar Italian pump that provides just the right level of extraction for your next espresso. There’s no need to fiddle with the pieces because the setup is actually super simple and the black color of the unit makes it look great wherever you choose to use it. You just need the slide and lock portafilter and you’re going to be ready to go. The steam wand makes it simple to get steam and frothed milk for your cappuccino or latte and the cup warmer even makes sure that your cup is the ideal temperature until you’re ready to drink it. You even get to choose between ground espresso or espresso pods. 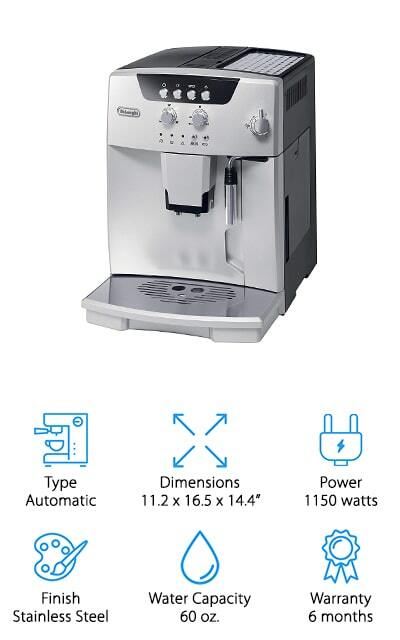 This is possibly our best home super automatic espresso machine, which provides you with plenty of features and capabilities. The stainless steel finish is sleek and looks great on any counter, while the variety of options are really what’s going to make you love it. There’s easy access to the dregs drawer, the drip tray, and the water tank, plus you get easy use for all the buttons and controls. Everything is available through the push buttons on the front and the LED display. You even get rapid steam technology and a wand for frothing or dispensing hot water. There’s a 1-year warranty that says this unit is going to keep working for you and it’s even compatible with a Brita filter so you can make sure the water that you’re using is the highest quality. 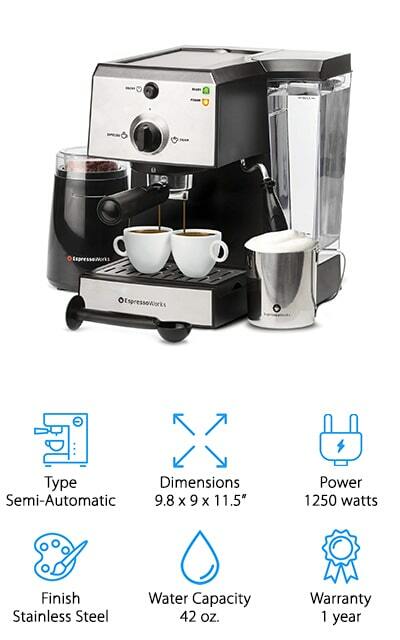 This super automatic espresso machine is definitely a great option for any home. 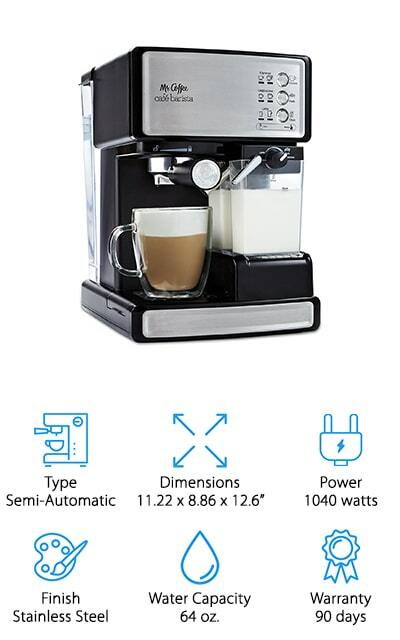 Here is our best semi-automatic espresso machine for home, which combines all of the features you could possibly want into one. It actually has 7 different pieces and offers you the opportunity to grind your own beans in just seconds. The water tank is visible and easy to remove, able to hold up to 42 ounces of water at a time so it’s always ready to go when you are. This semi-automatic unit is even stainless steel to provide a sleek and elegant look for your kitchen counter. The 15 bar pump gets out just the right amount of flavor from the beans and the milk frothing cup and wand make it easy to get your cappuccino or latte. You get to choose between a single or double shot of your favorite espresso each time and you don’t have to worry about the size of this unit because it can fit just about anywhere. Make sure you and anyone else in your house have the best espresso any time of the day or night. This fully automatic espresso machine also gives you the option to make cappuccino manually, so everyone in the house should be happy. There’s a professional burr grinder that offers 13 different settings to grind your beans and make sure that everything is the highest possible quality. You can also use pre-made grounds to make your morning coffee even simpler. The foam wand is easy to use so you get great steam and milk for a perfect froth and the coffee is always brewed exactly the same way each and every time. This stainless steel unit is going to look great and it’s going to be easy for you to clean and move around as needed. 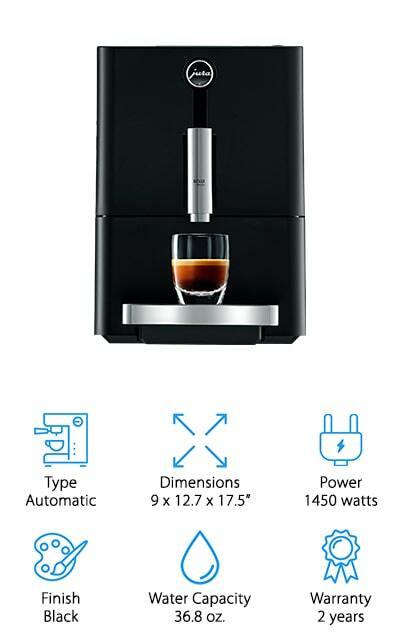 A little larger than some units, it still fits on your counter and gives you options for single and double shots of espresso and more. You’re going to spend a little more for this unit but you’re still going to get great quality out of it to combat that price. It holds up to 60.86 ounces of water at a time and has a 1-year warranty that both say it’s going to get the job done for you. It’s also going to give you plenty of options when it comes to getting that great cup. There’s a quick heat boiler that makes sure you don’t have to wait for the water to heat and you get a layer of milk over your cup at just the right temperature. You even get to choose the settings for your espresso strength and the length of each setting. The 100% ceramic grinders are guaranteed to provide you with pure coffee and a great level of flavor that comes from getting the best and highest quality out of the beans with every single cup. You’ll also have a simple to understand menu of options on the front and everything you could want in an espresso.